Combine art with your jewelry displays and transform your showroom into an attraction! 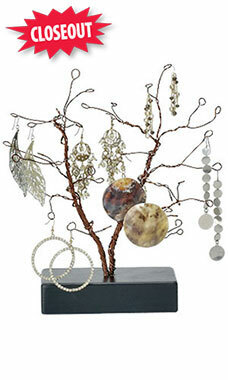 This unique wire tree is made to hold all of your dangly earrings for a 360 degree presentation that will capture the hearts of your customers. The beautiful arrangement enhances the glamour of the earrings as they naturally hang from the branches like lingering fruit. The branches are bendable and can be adjusted to your preference and it sits approximately 10 ½” high with a sturdy black wooden base.